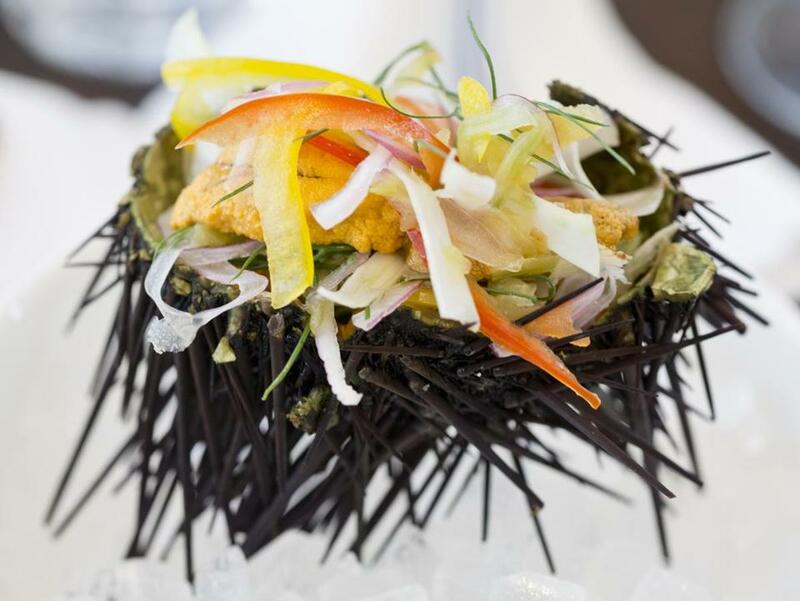 The sea urchin crudo at Bar Mezzana in the Ink Block development in the South End. Where to Bar Mezzana, an Italian restaurant in the South End’s Ink Block development. What for Beautifully pared-back dishes with a serious pedigree. The partners all previously worked with chef Barbara Lynch — chef Colin Lynch (no relation) as executive chef of Barbara Lynch Gruppo; Heather Lynch, his wife, as general manager of Sportello; and Jefferson Macklin as president and COO of the restaurant group. The scene Minimal decor. Blue upholstery. Midcentury chairs and lighting. A spacious bar and a gleaming white open kitchen where chefs chug water from plastic quart containers. The crowd is neighborhood-y — gay couples, straight couples, skinny tattooed guys in caps, young blondes in green cardigans, businessmen in suits. The atmosphere is neighborhood-y, too. Strangers strike up conversations and discover they live on the same block; staffers joke with patrons at the bar. 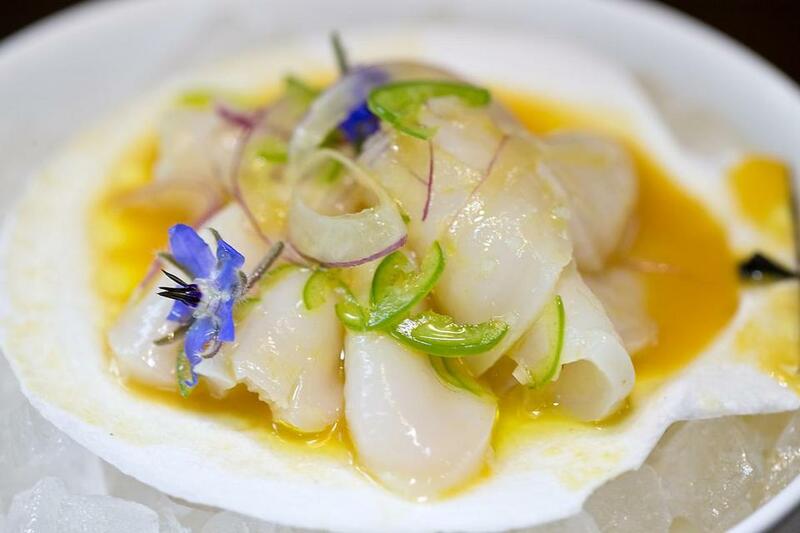 Live scallop crudo at Bar Mezzana in the Ink Block development in the South End. What you’re eating There’s a daily crudo list, almost a dozen different kinds of raw seafood paired with a few flavors: live scallop, yellowtail with grapefruit oil and chile, mackerel with radish and ginger vinaigrette. Prosciutto comes on a platter with a ball of creamy white house-made mozzarella. Crostini are topped with fava beans and pecorino; radish, butter, and anchovy; bone marrow and olive. There are a few salads and a few main courses — halibut, fried rabbit. But the star might be the pasta, from spaghetti with crab, sea urchin, and chile to sweetbread cappellacci. Care for a drink? Spritz cocktails make you feel like you're in Venice. Mostly local beer is on tap; bottles are from all over, with intriguing options like sour red ale Panil Barriquée and the amber Azienda Agricola Fré Ambrata, both from Italy. Wine is Italian, and the list of bottles comes categorized as “sorta like a pinot grigio,” “reminiscent of cabernet,” “nothing like anything,” and more.